TOWNSVILLE, Australia — Residents of Australia's cyclone-battered tropical northeast emerged from their homes on Wednesday to find roofs lying in their yards, boats flung onto rocks and roads blocked by tangles of fallen trees and power lines, as emergency officials tried to reach communities cut off by the powerful storm. Cyclone Debbie, which slammed into the coast of Queensland state on Tuesday with winds up to 260 kilometers (160 miles) an hour, weakened quickly as it moved inland and was downgraded to a tropical low by Wednesday morning. Australia's military sent vehicles, aircraft and supplies to the region, and clean-up efforts were expected to begin later Wednesday. Around 60,000 houses were without power, and several communities remained isolated with no access to communications. Emergency workers were trying to reach those areas to ensure residents were safe, Queensland Police Commissioner Ian Stewart said. "Nature has flung her worst at the people of north Queensland," Prime Minister Malcolm Turnbull told reporters. "It is now our job to make sure that every agency pulls together ... to provide support to the people of north Queensland who have had a very tough day and night." There were no reports of deaths from the storm. One man was injured after a wall collapsed in the town of Proserpine, Stewart said. He was in stable condition. 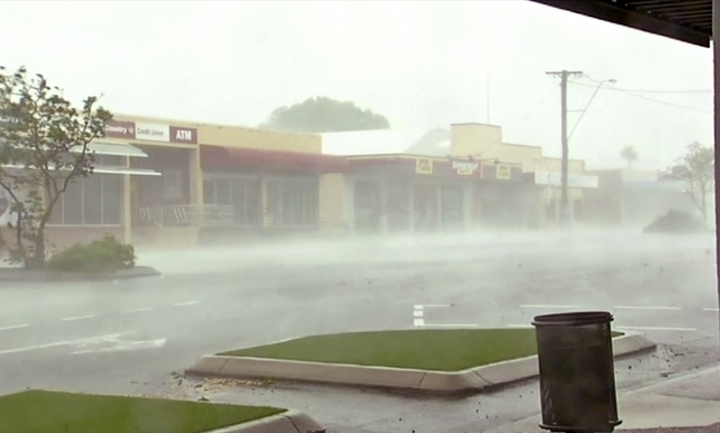 Proserpine was one of the worst-hit areas, along with the resort town of Airlie Beach and the town of Bowen. There was also serious damage to resorts on the idyllic Whitsunday Islands, a popular tourist destination, Queensland Premier Annastacia Palaszczuk said. Around 200 people vacationing on Daydream Island were awaiting evacuation, and water supplies were running low. "There would be nothing more tragic than waking up and seeing walls that have come in from your houses, roofs that have gone off, and debris that is lying across your roads," Palaszczuk told reporters. 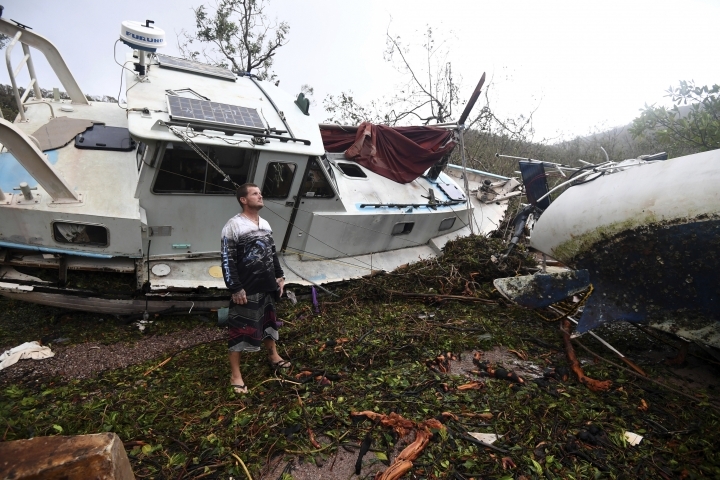 At the port of Shute Harbour, 10 kilometers (6 miles) east of Airlie Beach, the storm tossed around 30 vessels onto the rocks, Whitsundays Regional Council Mayor Andrew Willcox said. Queensland Fire and Rescue Service Commissioner Katarina Carroll said the state emergency services department had received 800 calls for help, and that number was expected to rise as power came back on in communities. 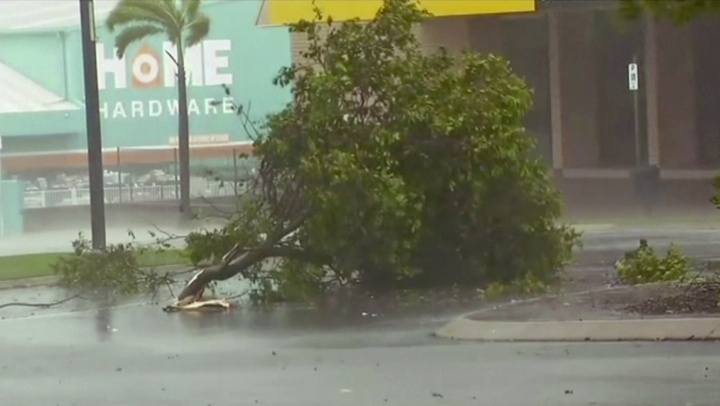 The area produces sugarcane and a wide range of fruits and vegetables, including mangoes and peppers, and farmers were just beginning to check on damage to their crops Wednesday morning. Farmer Bill Atkinson, who lives 25 kilometers (15 miles) from Airlie Beach, said the storm had battered his property, tearing roofs off sheds, knocking down trees and partially destroying his sugarcane. "It's going to be sad. It hasn't done (the crop) any favors," he said. "The cane is bent over, the tops are cracked off."